The mobile POS and payment terminal market is moving fast. 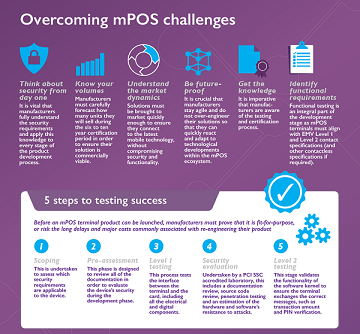 Stakeholders need to know they can rely on a trusted partner to deliver seamless contact and contactless transactions to the market in the shortest timeframes. FIME’s multiple areas of expertise makes it the natural end to end trusted partner for all your mPOS and terminal projects. Specifications and test plans interpretation. Identification and validation of applicable test cases. Whatever your mPOS and payment terminal project, you can rely on FIME’s expertise for a smooth deployment. Technical specification design and analysis. Test strategy definition based on use cases. Definition of the certification process, from registration to certification. Qualification of tools and laboratory processes. Test tool design and development. FIME’s expert team supports payment terminal and mPOS vendors throughout their development process. Market-leading expertise and a one-stop-shop: FIME has built a wide range of expertise in contact and contactless services over many years. Thorough consulting experience: FIME has provided training, specification development and support and test plans all over the world. An independent third-party: FIME’s consulting services are fully impartial. Worldwide presence - With its worldwide presence, FIME can follow and support each new project, wherever it may be. To aid kernel software development and debugging, FIME also offers its extensive experience and expertise to customers in the form of consulting and support services.